Nitehawks forward Bradley Ross fires one at the Spokane net. 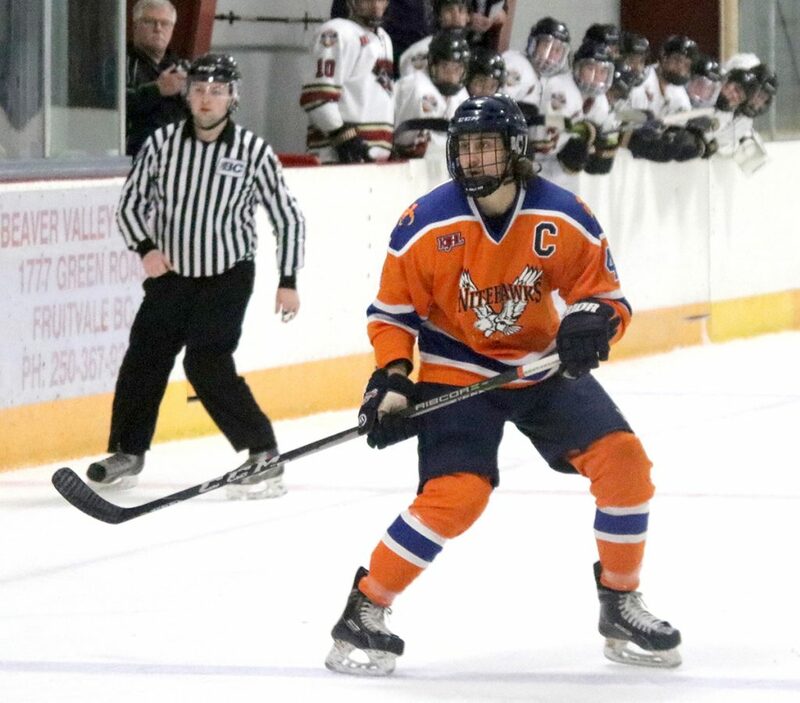 A four-point night from Bradley Ross launched the Beaver Valley Nitehawks to victory over the Spokane Braves on Tuesday at the Hawks Nest. 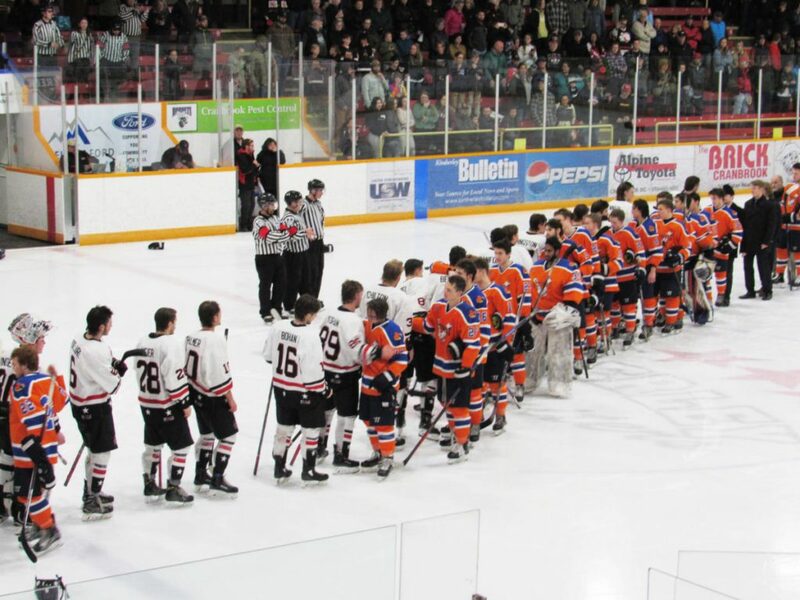 After earning just a point in two winnable games against Kimberley and Castlegar on the weekend, the Nitehawks exploded for five third-period goals for a much needed 6-2 win over Spokane. Ross scored twice including the game winner with 10:02 remaining in the third period to give B.V. a 3-2 lead and ignite the goal rush. The Trail product broke down the left wing and made a power move to the net to break the 2-2 tie for his first of two on the night. 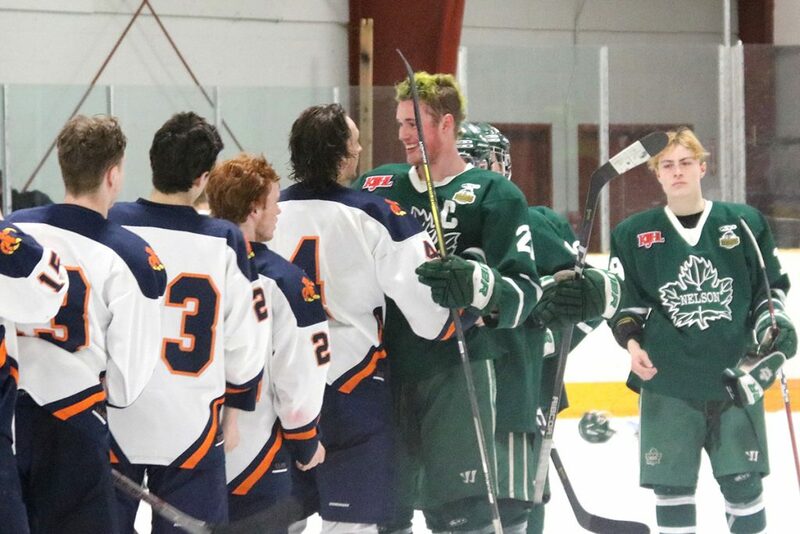 The victory leaves the 10-9-2-1 Nitehawks in second place, three points up on the Braves in the Murdoch Division standings, and six points behind the front-running Nelson Leafs. As a result, Nitehawks coach Terry Jones is one win away from 1,000 career ‘Ws’ and the Nitehawks can reach that historic milestone this weekend against Grand Forks. The game was tied 1-1 through two periods with Spokane taking a 1-0 lead on a first period power-play goal from Aaron Morris, but the Nitehawks drew even on their own power play in the second when a point shot from Kyle Guenter found its way through traffic and past Braves goalie Ben Waslaski. Morris put the Braves up 2-1 just 30 seconds into the third period for his 12th of the season. However, B.V. forward Morgan Peace tied it on the power play, taking a pass from Ross in the slot and sniping it past Waslaski at 14:31. Just five seconds after Ross made it 3-2, Paul Leroux pushed the puck forward off the ensuing centre-ice face off and Angus Amadio flew into the Spokane zone tipped it past the defenceman and fired it home for a 4-2 lead. With the Nitehawks shorthanded, captain Jake Yuris broke up a play at his own blue line, skated down the left wing and set up Ross in front to make it 5-2 at 9:21 for the third B.V. goal in 41 seconds. Four minutes later, Yuris again took off from his own end, broke down the right side and fed Michael Hagen in the slot to complete the scoring with just over five minutes to play. 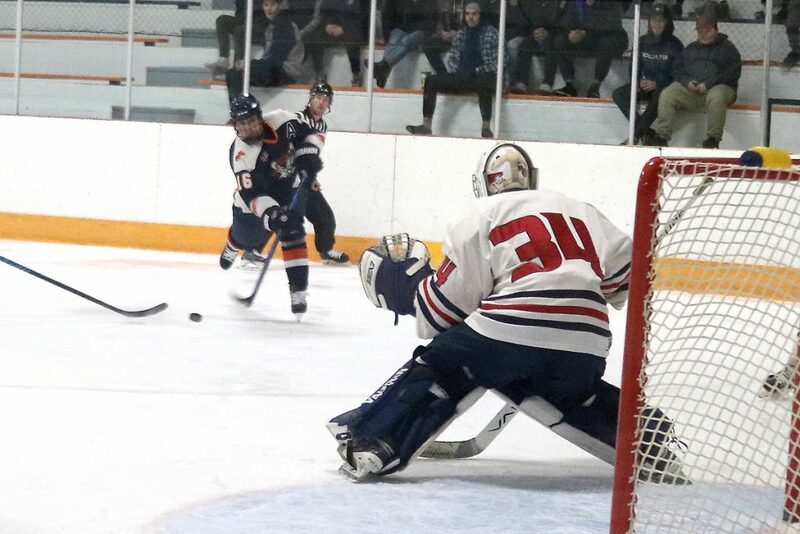 The Nitehawks outshot the Braves 26-25, with starting goalie Noah Decottignies getting the win for B.V. The Hawks went 3-for-8 on the power play and 5-for-6 on the penalty kill. Ross, the Nitehawks player of the game, scored twice and added two assists and linemates Peace had a goal and two helpers, while Hagen scored once and added an assist for a nine point night for the trio. Injuries rocked the team last month, with Simon Nemethy gone for more than a month, Decottignies, Amadio and Ross out for two weeks and Peace missing all of October with upper body injuries. With the return of Ross, Amadio, and Peace, the chemistry is starting to creep back into the line up. B.V. still has three players on the DL including Nemethy, and brought up AP Dayton Nelson from the Major Midget Ice for Tuesday’s game. 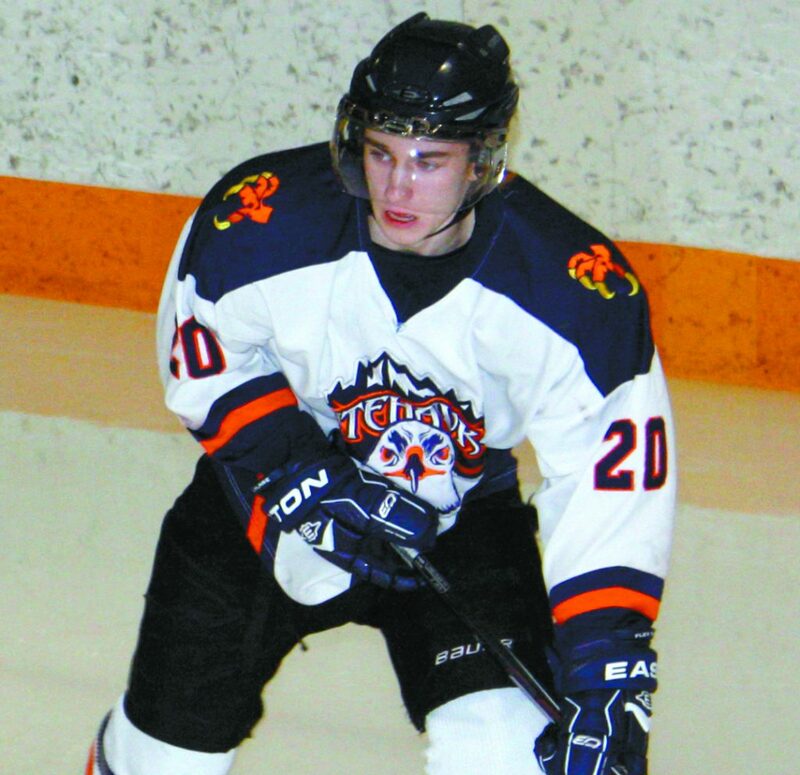 October was a callous month for the Nitehawks. Following a strong start, a tough schedule combined with injuries saw the Hawks struggle to a 2-7-1-1 record in October, but results already show improvement in November with a 2-1-1-0 record. Beaver Valley will look to make history on Saturday against the Border Bruins. 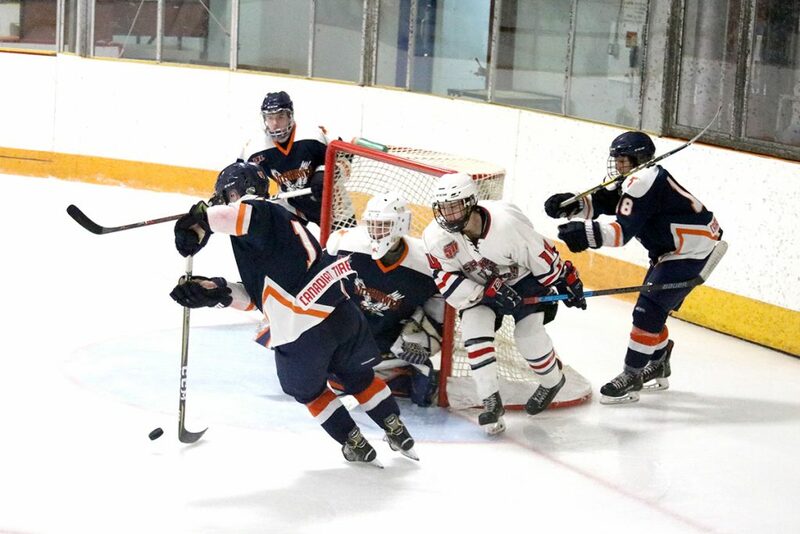 With Jones poised to do what no other coach in the KIJHL or any other Jr. B league in North America has accomplished, the Nitehawks players should have ample motivation come game time. The puck drop goes at 7:30 p.m at the Beaver Valley Arena, as the quest for 1,000 wins continues.